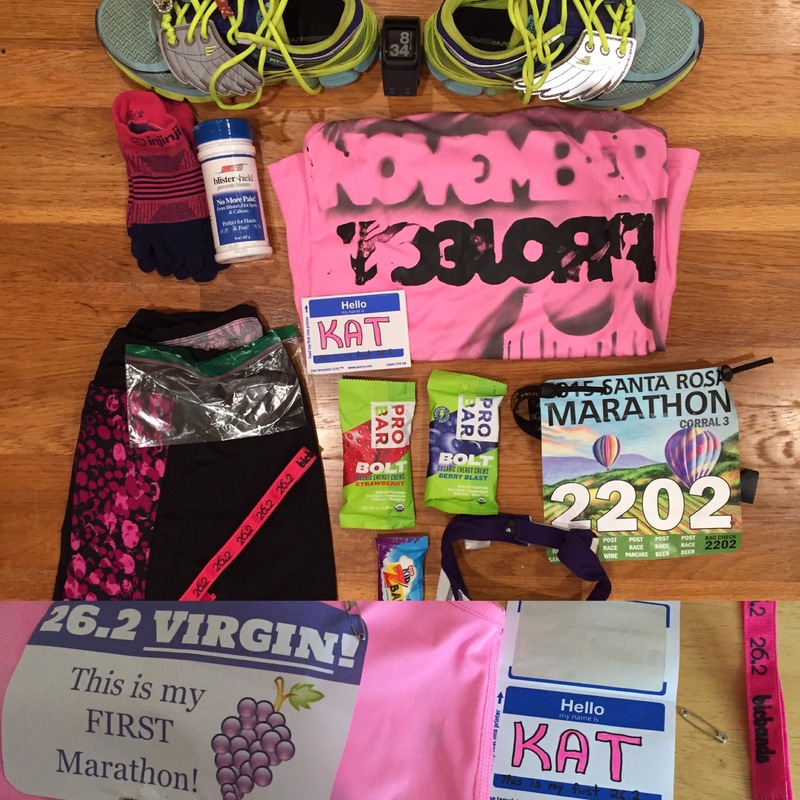 Birthday Weekend Half Marathons (double trouble)!! The last long run before this race was Monday at a quick clip of 5 .5 miles. The weather looked cool but at the pre-race warmup, realized that I didn’t need the sleeves because it was on the humid side. Warmer than expected. I taped everything because I didn’t want to feel the calf soreness since Monday and didn’t want to strain anything because I am running another 13.1 tomorrow. After mile 6, I slowed down. It was a warm day, there were hills, there were long stretches, I was tired. But! At mile 12, T was waiting with this sign which fueled the last mile of the race – I did it without stopping to walk. Goal was under 2:15 and I accomplished it! My two friends were waiting for me at the finish. So glad to have them with me on my birthday weekend. Lucy Run Capris – I love that they have reflective strips on both sides!!! Morning Of: Oatmeal with crasins, almonds, brown sugar and cinnamon; 1 cup hot caffeinated tea with splenda; nature valley crunchy oat bar. During: 1 pack of Pro Bar Bolts with caffeine; 1/2 package Pro Bar Bolt without caffeine; 1/2 kidz clif bar, chocolate chip; water. Pre-race Injury: No injury. Sore calves since Monday after 5.5 mile 10 min/mile run. Taped: Both knees, hamstrings, groin, calves. During: Calf soreness @ mile 10. Post Race: Stretched well after the race (Thanks to T). Lunch in Livermore, 1 hr commute home. Took a ice bath after I got home. No stretching or exertion after that. Day after (and before next half marathon): Sore calves. Stiff back in starting corral. 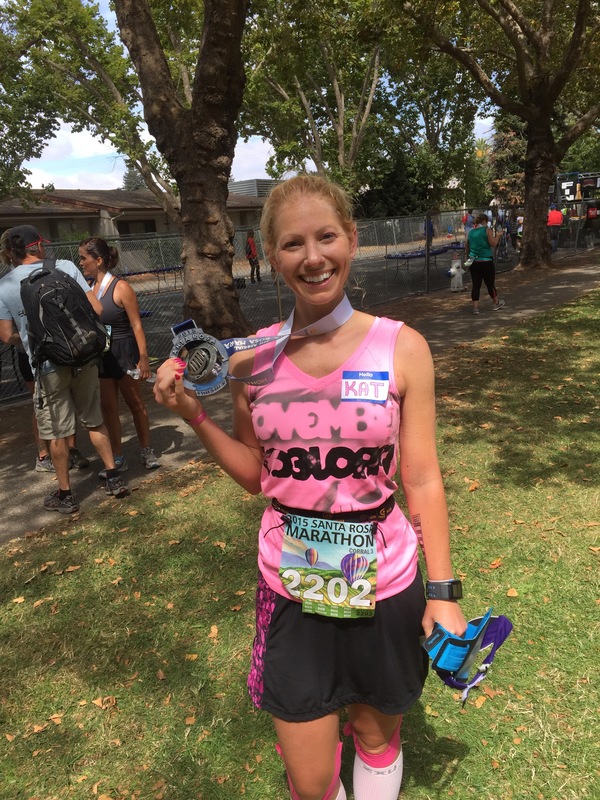 Wow, 12 half marathons in two years. Let’s let that sink in for a bit. This was my second half marathon trail run and with 2400 feet of elevation gain it was certainly an accomplishment. I was tired for two days after and sore all over. The good kind of sore. No injuries! During the entire race it was either raining, down-pouring or raining with wind that stung like hail. I enjoyed every minute of it. =) The Orange Mud Hydroquiver double barrel was an excellent accouterment for this endeavor. My calves started to tighten around mile 8 when I’d run the hills so I walked most of them. I didn’t mind the walking because this was a training run for a half in March. You can imagine how happy I was when even with the walking and the weather/trail conditions, I came in under my estimated time of 2:56 (official time 2:51)! I kept my head in the game and this was the right distraction from life this particular weekend. After finishing, I couldn’t help but smiling and filling with joy as I walked to the ocean and soaked my legs up to my thighs in the ocean. I mean, how often do you get to go into the ocean fully clothed with shoes and all?! I felt like a kid! In the stall of the bathroom at the restaurant pebbles kept coming out of my shoes and my socks while I changed, which only reminded me of how much fun I just had. Brunch included recovery eggs and potatoes along with a gang of November Project friends. Beer and a bubble epsom salt bath followed at home to round out a fantastic Sunday. Pre-race Injury: No injury. Spasming back. Tight hamstrings. Taped: Both knees, hamstrings, calves. During: A couple of times the calves tightened and so I walked. My hamstring was only slightly tight on the run. Post Race: Not much stretching after the race. 5 minutes of soaking in the ocean. 1 hr drive home. Took a salt bath after I got home. Day after: Sore hamstrings, quads, neck, shoulders, back. Calves were a little sore, not bad at all! Two days after race: Sore hamstrings, quads, shoulders. The half marathon trail run was great! It started out arriving about 45 mins early, parking at Huddart Park was not a problem. I stayed bundled up in my winter coat while i collected my bib, it was 47 degrees. I went back and forth about wearing capris with a long sleeve shirt or short sleeve with arm warmers. I went with long sleeved. While standing in the small corral about 4 mins before the gun, I decided to run back to the car (which was close) to switch out to warmer gloves because my fingers were turning white (I have raynaud’s). The race started and it was single file on the very very narrow trail for 1 mile. Then it opened up and I was able to slow my pace. People were passing me but I didn’t care, I wasn’t going for a particular time. The forest was beautiful, with pine needles on the path and mossy trees. Lots of redwoods and redwood smells. The elevation was a climb for 4 miles, an ungulated trail for 5 miles with an aid station toward the middle then a decline for 4 miles back to the start/finish. The aid station had all types of food: boiled potatoes, bananas, PB&J sandwiches, M&Ms, Clif Bars, Clif shots, potato chips, coke, mountain dew, and electrolytes. The climb was tough, lots of walking, my heart rate was up to 168 while running uphill. On the downhill, it was a good recovery from the tough climb (140 BPM). My watch said 11 miles and I texted my trail buddy who was waiting at the finish to let her know the estimate time of finish. 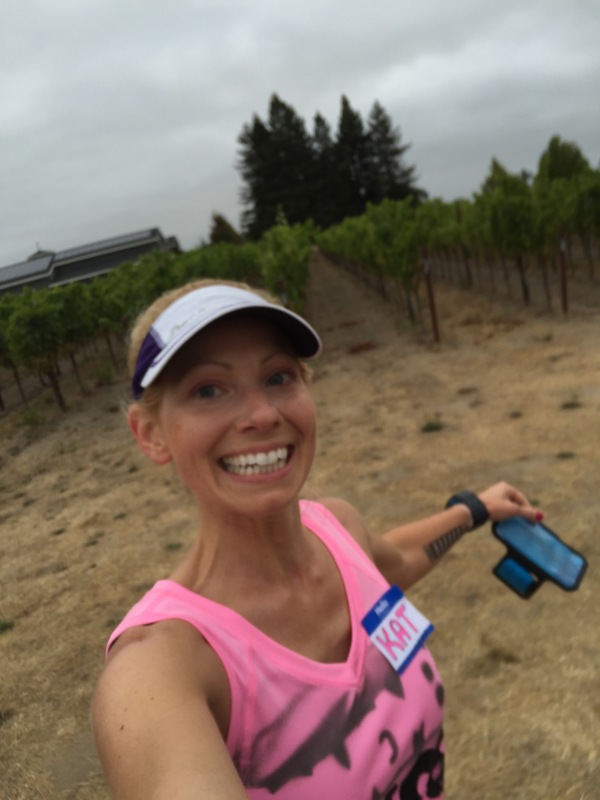 I was feeling great and ready to tackle the last two miles (and then some!) Then at mile 11.5 a sign said “Finish!” with an arrow. WFT?! Right around the bend was…. the finish! I didn’t run fast to it, I was confused and honestly didn’t want it to end. I had estimated a finish time of 2:56 and came in at 2:50. I went to map the route on mapmyrun to find out what it says because it didn’t feel like 13 miles and it mapped out at 12.2 miles. The entire race was fun and had lively conversation because I was running with my weekday running buddy who has now been turned onto trail running because of me. He signed up for this race after we ran around this park as a training run a few weeks back. It was a small race with a small budget. There were no mile markers on the course. The race medal was the same for the 50k, 35k, half marathon and 10k distances. The race premium was a red long sleeved technical tee with christmas trees on the back. At the finish they had the same goodies as they did on the trail, plus a plethora of chips (including veggie), chocolate milk, apple pie, christmas cookies, cupcakes, and salsa. I came home and took a salt bath. My back is the only thing hurting and has been bothering me for the past three weeks. I’m going to my PT tomorrow about it. I’m pretty dehydrated and need nutritious food. Pre-race Injury: No injury. Tight back (not due to running). Tight right hip flexor. During: A couple of twinges in the calves. My hip flexor has been tight and was tight on the run. Post Race: Stretched after the race. 1 hr drive home. Took a salt bath then wore compression sleeves after I got home. Back on the running band wagon, or so I thought. The 10 miler went well, since I had a running buddy who kept me at a 12 min/mile pace and I stuck to the 2 min run/ 1.5 min walk strategy. 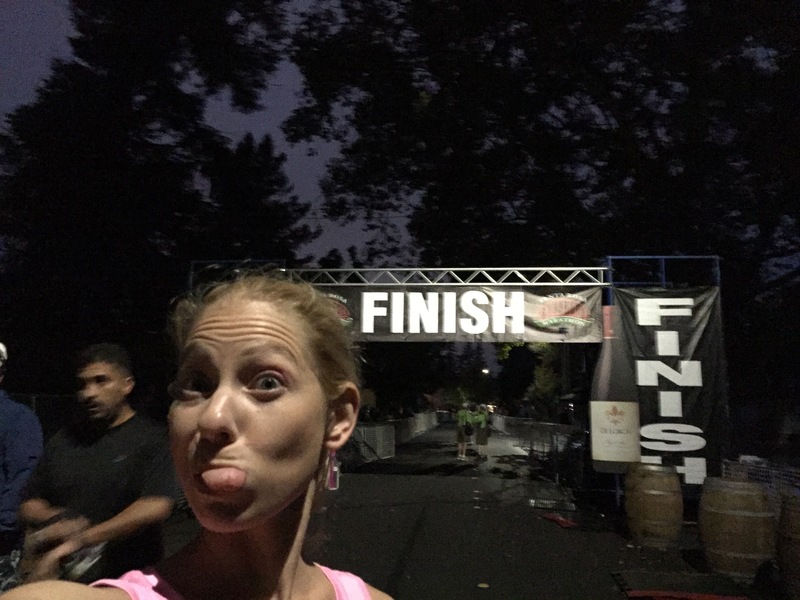 I used the same strategy for this half marathon and stayed with the 2 hr 30 min pace group for the first 7 miles doing my run walk, which kept me at a comfortable 11:26 pace. At the hill I pulled forward as everyone slowed and then raced down the hill. After the hill I spotted two women wearing matching shirts and I recognized the design of the shirts as the same company that my two sisters and I just bought our matching shirts from for the October half we are doing together. I asked them if they found the shirts to be comfortable and they both said yes. Then they continued to talk to me. They stopped to refill their water bottles while I passed up the aid station and surged forward. They caught up to me though and started chatting again. I’ve made some new friends and we plan to go running in Marin on some trails soon so they can train for their 50k endurance trail race. My calves were sore right after the Saturday race and so was both groins. It was Tuesday when I went for the first run that I noticed my right groin was indeed injured. I’m sad, frustrated and confused. This is the opposite groin that was injured last time. Questions circling to find the cause, overtraining? Yes. Running down hill during the half? According to the last runners world magazine, running downhill creates elongated quad muscles and micro tears so probably contributed. Lack of stretching? Maybe. I had taken care between the 10 miler and half by running short distances and continuing the longer walk breaks. I think my competitiveness came out and was the ultimate cause. Now to skip my long run this weekend and rest till this groin injury is over because I don’t want a repeat of this spring where it lead to SI pain. I have a PT apt scheduled for the day I return from vacation. During: both groin soreness mile 4-13. Calves a medium soreness mile 4-13. Post Race: Stretched a little while waiting in line with friends, cool breeze. Both groin low pain, calf soreness, wore compression sleeves when I got home. Day after: walked 18 holes of hilly golf. Aleve all day. Groin pain was low, and calf soreness low – just a few awkward steps after waking up. three days after race: went for a run and only got .5 mile before realizing it was an injury and not soreness. I signed up for this 10 miler because it was a series of three and I had run the first one. The second one was canceled due to low entrants and I was grateful because I was nursing an SI/groin injury. It was a surprising morning because L’s afternoon tee time meant that he could run the 10 miler with me and I jokingly told him if he could run 10 miles untrained and the carry a golf bag 18 holes, that I could walk the golf course with him after too. And that’s what we did! I think the walking may have helped the recovery. He paced me and we stuck to my 2 min run / 1.5 min walk strategy. We finished strong and then drove down to the golf course. I had no soreness or injury from this run. Number 7, wow. And Half Marathon #1 was just a little over a year ago. This was the inaugural event of this half, and is put on the same organizers of the SF US half. 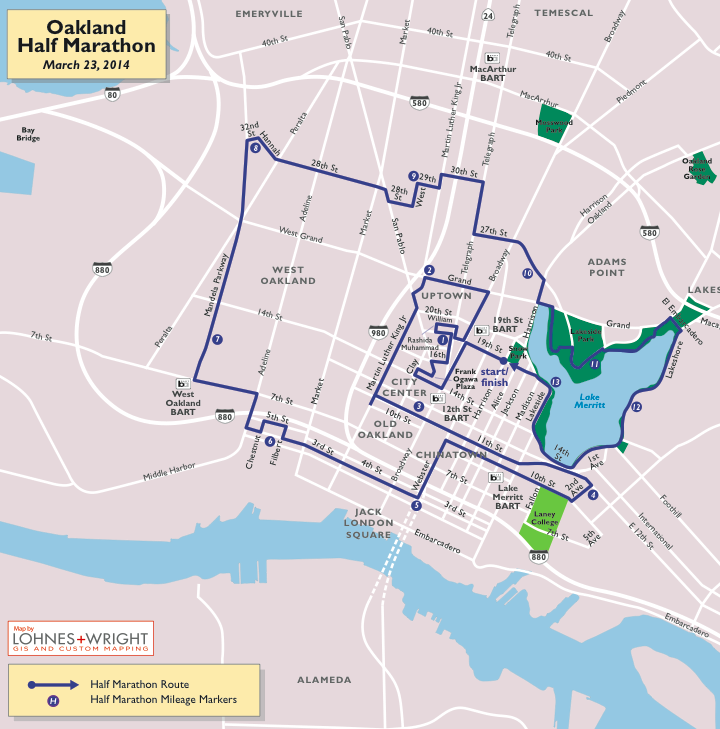 They are also planning an Oakland Half, which will be the second for that city. 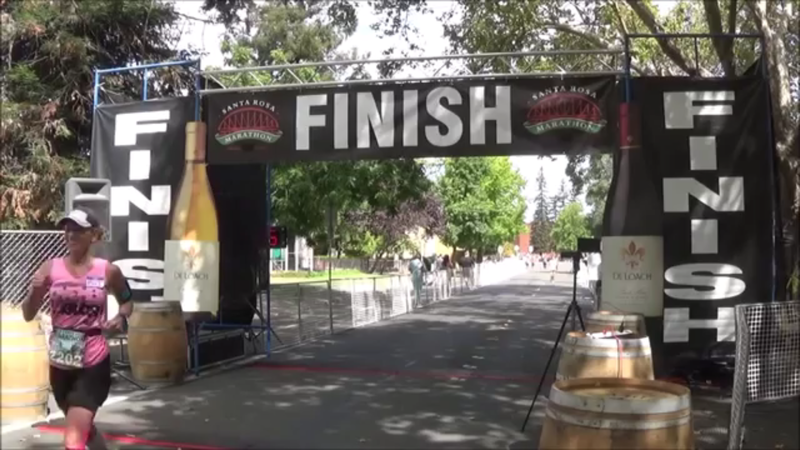 The Livermore Half Marathon expo was the night before the Saturday race. The expo was on the green outside a theater and quite small 9 booths. The town of Livermore is quaint, with some pretty good looking restaurants. 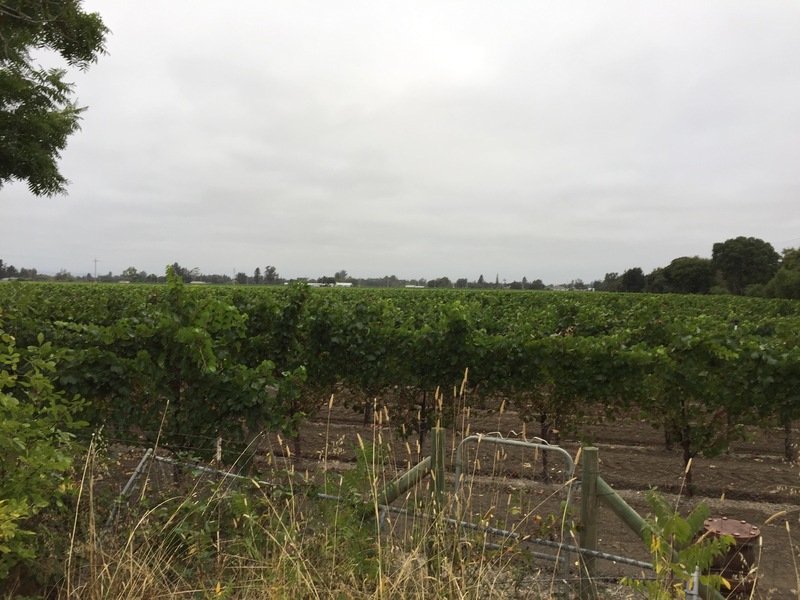 It’s set in a lesser known wine country of the SF bay area. I knew this would be a nice race even though I was injured and on tired legs because it was my birthday and was just for fun, but I had no idea how wonderful it would end up. I had an unexpected running buddy which kept me motivated and was the sole reason for my steady negative splits. I made sure to start out slow among the chaos of runners unguided by pace/corral markers. I did my usual run walk which meant I was running on the sidewalk a lot because running in the angled part of the street near the gutter is less than stellar, but that changed by mile 3.5 when the course turned into a park with a pedestrian only path. There were meadows upon meadows. So pretty. I made sure to take in the moments – to be present and look around. There were a number of small hills through many vineyards, which made the course interesting. The route wound past a golf course with a hole named “Lombard” after the famous crooked street in SF. The final few miles were back in the city. Looking to the left I could see the tents for the after party, the shoot and where I’d double back to cross the finish line. I was so happy to have completed this on such tired legs and with an injury. As I rounded one of the last corners, I saw the 2:30 pace group waving people to pass them. They were way out in front of their time and were holding back so they would cross at the correct time. I couldn’t believe I’d come in around 2:30! I had been running without feedback from my Nike+ app on purpose (this was a fun run), so I really had no idea what my time would be and was expecting something closer to 2:40-2:45. What a nice birthday surprise. There were very few people clapping and cheering on the people who were finishing, it was extremely odd but that didn’t stop me from having a huge smile on my face because I was about to finish. I turned around, after getting my medal, to wait for and cheer on someone I had chatted with on the course. As I was passing her around mile 10, a friend of her’s called her name from the sidelines, so I said “Good job, Jesse”, asked if this was her first half, it was. She was probably 14-16 years old. As she neared the finish line, I called her name and cheered her on, then walked over to hear and congratulated her. She said she enjoyed the experience. Another birthday delight was having my favorite donut, blueberry cake, after the race, free with race entry, along with champaign. I had checked a gear bag with two shirts like last time and boy were they needed. There was no rain during the race, but the wind picked up and the sweat was chilling me as I stretched and sipped champaign. There were aid stations every other mile, which was the perfect amount to keep my palette wet. I had oatmeal in the morning, and only Bolt chews during the race. The after party was in the middle of town, which left little space to sit to stretch and no space that would have been soft enough for some stretches. I bet next year it will be better organized and I’d certainly do it again, especially if it’s the weekend of my birthday. Pre-race Injury: Left groin pull. Both calves were sore the days leading up to the race due to race the previous Sunday. The day before the race the left calf was feeling fresh, but the right was still sore. Tight Achilles/planter facia (more on left than right). During: Tylenol and Aleve. Left hamstring tightness mile 0-10. Left groin pull mile 0-4. Calves a medium soreness the entire route. Post Race: Stretched at home, then ice bath within 4 hours of the race and continued with Tylenol. Left groin pull low pain, right calf soreness more significant than left but both were mild after the ice bath. Day after: Aleve all day. Ice bath in the afternoon after foam rolling. Soreness in the back. Calves more sore after foam rolling and ice bath. Groin pain was low, and only when twisting would it hurt.